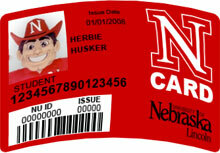 The NCard is nontransferable and is the property of the University of Nebraska-Lincoln. It should be protected from abuse that could damage the proximity chip and antenna coil or scratch the magnetic strip. It should not have holes punched in it. As of January 8, 2018 a $25.00 replacement fee will be assessed to cards showing signs of intentional damage. Proximity cards contain an antenna coil and integrated electronic chip therefore, care should be taken to guarantee the card's functionality. Place in a wallet, purse or other protective holder. Clean with a soft, non-scratching cloth. Use the card for anything other than its intended purposed. Leave it in direct sunlight, for example on the dash of a car. Expose it to extreme heat or open flame, for example clothes washers, dryers or irons. Expose it to organic solvents, thinners, mineral spirits, etc. Use it as an ice scrapper or scraping tool. Crimp, bend, or twist the card. Immerse in alcohol, Isopropyl,ethanol, methyl etc. Bite or chew on the edges of the card. Pound with a pen or tool. Punch holes in the card.